Understanding of women's fiqh associated with female bleeding (dima' al-mar'ah) is very important to be owned by men especially by women. Syari'ah and Law Faculty’s students are required to understand Shari'ah and law knowledge, one of which is about women's bleeding. 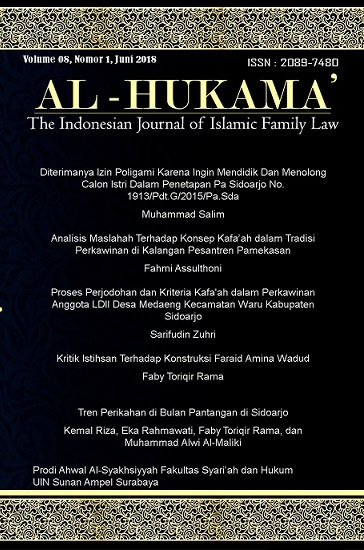 However, in the curriculum of study programs in the Faculty of Shari'ah and Law of UINSA no one specifically discussed the matter. Understanding of students related to menstrual blood, childbirth and istihadhah majority is still at the moderate level. They can only define and know the difference in time when the blood comes out. As for the wisdom and legal implications for women who experience bleeding in the implementation of worship, they still do not know and define it. The implications of legal law that they know are only limited to prayer, fasting and carrying, holding and reading the Qur'an. The rest they are still confused or do not know. Of the several factors that influence a person's understanding, there are five main factors that greatly influence students' understanding regarding menstrual blood, childbirth and istihadhah, namely factors of experience, intelligence, gender, education and school environment. Other factors that are age, occupation, socio-culture and economy, and the amount of media information does not affect the students' understanding regarding menstrual blood, childbirth and istihadhah.